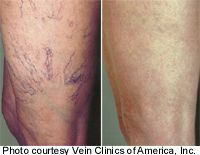 The photographs show spider veins before and after sclerotherapy. Spider veins are the enlargement of the smaller veins in the body. Spider veins are usually treated with an injection of a solution into the vein. The vein then shrinks and disappears. Some spider veins can be treated with only one treatment and treatments are often needed only once or twice a year. The photograph on the far left is before sclerotherapy and the one on the right, after treatment. Varicose veins are veins that are swollen or twisted and are most found mainly in the legs (lower and upper). The reason varicose veins become so unsightly is that they have lost their main function, which is to carry blood to flow through them. Since blood can no longer move through the veins at a speed that is consistent with the rest of the body's blood flow; the blood backs up or overfills in certain areas. Once blood overfills or backs up it causes the veins to bulge which then causes the vein to rise above the surface of the skin.